I hope you all are enjoying your weekend! Today's post features another installment for the natural hair website, KinkyCurlyCoilyMe. This week, I had the pleasure of interviewing spa owner, Tassie, at the Raleigh-based spa, Restorations Holistic Skin Care Services. Tassie and I discussed facials, skincare and more! To see the full interview, click here. Also, all my previous posts are listed here. 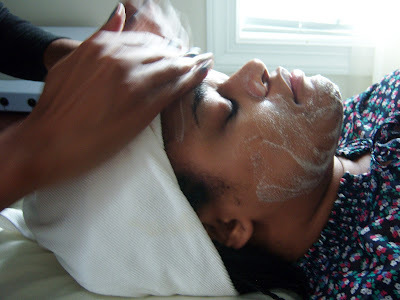 I love facials, they are sooo relaxing. Your skin is awesome, btw. Thanks for stopping by to check out my blog! :-) Thanks for the compliment. That was my first facial and definitely a great experience. I plan to go back next month.